This view from NASA's Cassini spacecraft shows the path of one of Jupiter's jet streams, a line of V-shaped chevrons travels west to east just above Jupiter's Great Red Spot. Most of the planet is unfolded here in a single, flat map made on Dec. 11 and 12, 2000, when NASA's Cassini spacecraft flew past Jupiter, and was released March 13, 2012. A new video of Jupiter captures dynamic changes in the planet's atmosphere caused by an invisible wave rippling one of the gas giant's fast-moving jet streams. Astronomers used the new movies, which were created using images taken by NASA's Cassini spacecraft, to study these atmospheric interactions on Jupiter and how they compare to similar jet stream motion in Earth's atmosphere. "This is the first time anyone has actually seen direct wave motion in one of Jupiter's jet streams," study leader Amy Simon-Miller, of NASA's Goddard Space Flight Center in Greenbelt, Md., said in a statement. "And by comparing this type of interaction in Earth's atmosphere to what happens on a planet as radically different as Jupiter, we can learn a lot about both planets." Similar to Earth, Jupiter is encircled by several fast-moving jet streams. Earth's strongest and most recognizable jet streams are located near the planet's north and south poles, and they have the ability to influence weather on the planet, the researchers explained. These winds blow west to east, but they get jostled around as they interact with slow-moving waves, called Rossby waves, in Earth's atmosphere. Astronomers identified Rossby waves in Jupiter's northern hemisphere about 20 years ago, but they had never been directly detected. Researchers were also confused because these waves were not found in the planet's southern hemisphere. In this new study, Simon-Miller and her colleagues analyzed images taken by Cassini, NASA's Voyager spacecraft, the Hubble Space Telescope and a decade's worth of observations by amateur astronomers. David Choi, a postdoctoral fellow at Goddard, stitched together about a hundred Cassini images to make each time-lapse movie, which zooms in on a single jet stream in Jupiter's southern hemisphere. Cassini is currently in orbit around Saturn, but the spacecraft flew by Jupiter in 2000. 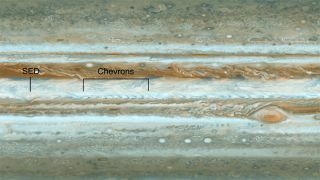 The videos show a line of small, dark, V-shaped features called "chevrons" along one edge of the jet stream. At the start, these chevrons are traveling west to east with the wind, but later, they are seen to ripple and move north and south. "That's the signature of the Rossby wave," Choi said in a statement. "The chevrons in the fast-moving jet stream interact with the slower-moving Rossby wave, and that's when we see the chevrons oscillate." The researchers also found that these chevrons are tied to another type of wave in Jupiter's atmosphere, called a gravity inertia wave. "A planet's atmosphere is a lot like the string of an instrument," study co-author Michael Allison, of the NASA Goddard Institute for Space Studies in New York, said in a statement. "If you pluck the string, it can resonate at different frequencies, which we hear as different notes. In the same way, an atmosphere can resonate with different modes, which is why we find different kinds of waves." The jet stream that circles Earth's north pole travels west to east. But when the jet stream interacts with a Rossby wave, as shown here, the winds can wander far north and south, bringing frigid air to normally mild southern states. Our planet also has gravity inertia waves, and they can sometimes be seen in repeating cloud patterns, the researchers added. Studying Rossby waves and gravity inertia waves on Jupiter could help astronomers probe the deep atmosphere of the gas giant planet. In their study, the researchers also used images that amateur astronomers had been gathering of a giant storm called the South Equatorial Disturbance. Their observations revealed the dynamics of this transient storm and its impact on the chevrons. The scientists now think the South Equatorial Disturbance and Jupiter's most famous storm, the Great Red Spot, could explain several differences found between the jet streams and Rossby waves seen on the two sides of the planet's equator. "We are just starting to investigate the long-term behavior of this alien atmosphere," study co-author Gianluigi Adamoli, an amateur astronomer in Italy, said in a statement. "Understanding the emerging analogies between Earth and Jupiter, as well as the obviously profound differences, helps us learn fundamentally what an atmosphere is and how it can behave." The detailed findings of the study are published in the April 2012 issue of the journal Icarus.